Star Wars: The Last Jedi is jam-packed with funky creatures, like the crystal foxes, the divisive cat-horses, the milk monster, and those perfect little Porgs, but one creature we didn’t get to spend too much time with was the Lanai, Ahch-To’s caretakers. 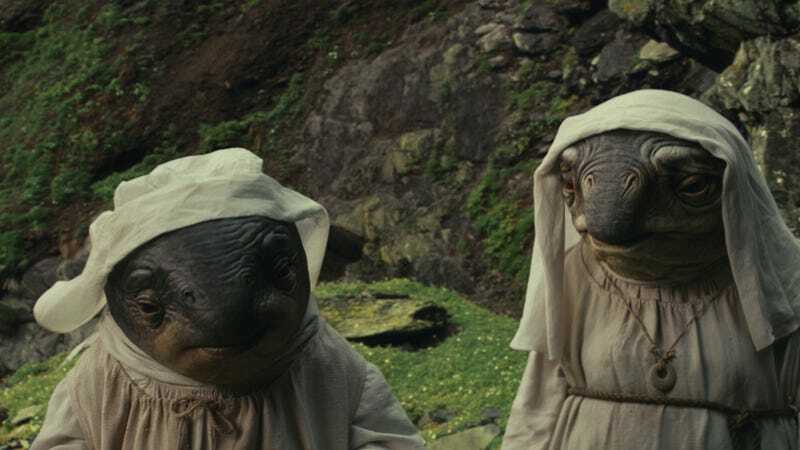 Better known as the “fish nuns,” we only see them briefly in the film while Rey is trying to convince Luke to teach her the ways of the Jedi. Back in January, though, we noted that the novelization of The Last Jedi would include a scene cut out of the film in which Luke tricks Rey into thinking the Lanai were being attacked, showing us more of what they do when they’re not silently judging Rey as she breaks everything on their island. That scene will be included on the Blu-ray version of The Last Jedi (available later this month), but a low-quality version of it has already found its way online ahead of tomorrow’s digital release. In the clip, which you can see above, Rey accidentally crashes a Lanai party, appeasing them with a playful lightsaber wiggle before confronting Luke about why he’s being such a jackass. It wouldn’t have really added anything huge to the movie if it had been left in, but there’s a nice gag with Chewbacca and it’s always nice to see more of the fish nuns. Other clips from the special features have also popped up online, included a touching sequence in which Mark Hamill sees Yoda—and puppeteer Frank Oz—for the first time.